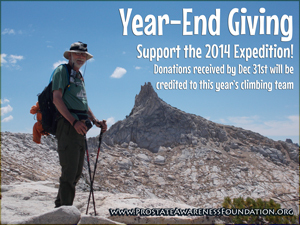 There is still time to make a donation, or an additional year-end gift In support of the 2014 High Country Expedition! You can support the mission of the Prostate Awareness Foundation and the Sustainable Prostate project by making a donation before December 31, 2014. For those who make a donation in the Memory of a Special Individual or in the Name of Someone Living with Cancer, the names of your loved ones will be added to the 2015 banner on the Prostate Awareness Foundation website. 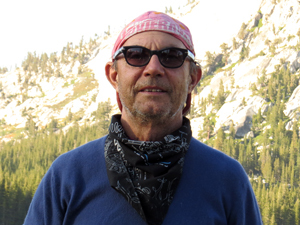 Your generous contribution is tax deductible and helps our non-profit to continue to reach men and their families with critically needed and reliable prostate health information. Last year, PAF reached 5,000 – 6,000 men and their families with non-biased information about prostate health issues. Our membership not only includes members in the United States but also Canada, Asia and Europe. We offer our most sincere thanks for your donations. Without your support and the contributions of other socially conscious individuals, PAF would simply not exist. Please ask them to contribute by supporting your elected payroll deductions with a tax deductible contribution. For reference PAF’s non-profit EIN # is 311633278. Some companies will make up to a 100% match. You may want to check with your employer to see if they are setup to do this. What does the Prostate Awareness Foundation give to men and their families? Hope! Please take a few minutes out of your busy schedule to read this information. I think you will find it is important to you, your family, loved ones and friends. This year over 200,000 men will be told they have prostate cancer. 1 in 5 men diagnosed is under 60 years old! There is no one conventional treatment option superior to another. The recurrence rate after treatment is over 40%. Men need to remain vigilant after treatment, but in many cases they do not. The side effects of conventional treatment are in many cases more damaging than the disease itself. Incontinence, sexual dysfunction and emotional trauma are common. Making a treatment path decision can be overwhelming. How do you separate “marketing hype” from reality? Only 3 % of those diagnosed will die from the disease. The latest clinical research on prostate cancer indicates that many men are being over treated for a disease that is unlikely to kill them. There is a time and a place when aggressive intervention is necessary. But often times it is not. So what’s a man to do? That’s where the PAF comes in. Helping men and their families figure out what to do and helping them to adopt a proactive approach to prostate cancer treatment and prevention is what the PAF is all about. We offer a 24-hour hotline for those seeking information in the United States and abroad, weekly hikes, and monthly support groups in the San Francisco bay area and just north in Sonoma County. All PAF offerings are absolutely free. We do not accept contributions from Big Pharma or Big Medicine, that way we can provide unbiased information. The PAF reached over 5,000 men last year with a message of hope. We need to do more. But we need your help to broaden our reach. PAF would like to expand diet and exercise program offerings to include prostate-friendly cooking classes. And, perhaps more urgently, the Foundation needs to update its nine year old website, create and distribute a new brochure and update its equipment infrastructure. 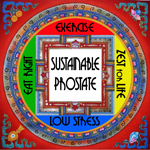 That way we can help more men and their loved ones that need help weaving thru the prostate labyrinth. Men and their families all over need to know they can take a proactive approach to sustaining their prostate health. The PAF provides free, non-biased, patient driven information to those who wish to take a take charge, positive approach to this epidemic problem. Thanks for your generous support. Wishing you continued good health and well-being.